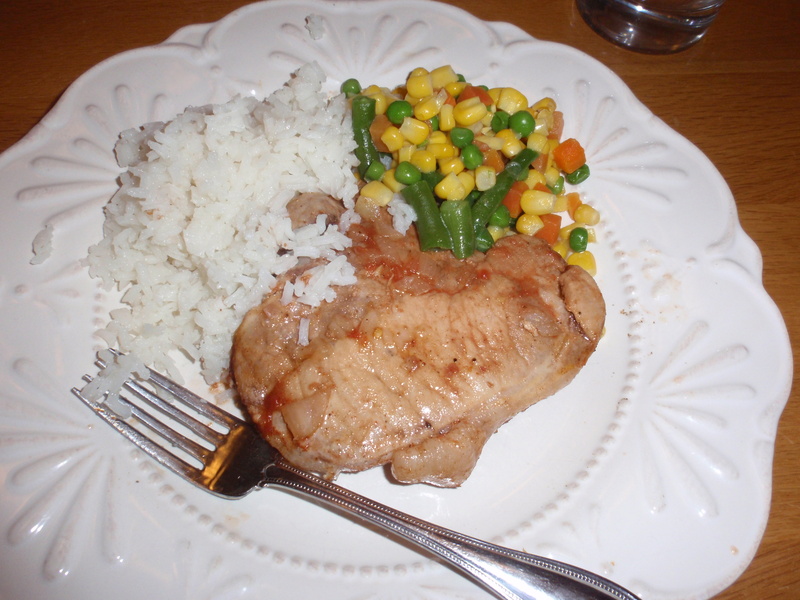 Here is a real simple BBQ pork chop recipe that you can either cook up in the crock-pot or in the oven. I included all the prices of the ingredients I used to show how eating organic can be affordable. This recipe is so simple, I put it together with a baby attached to my hip and two fighting preschoolers in the background. Go Go Gadget MOM! Mix all ingredients together. 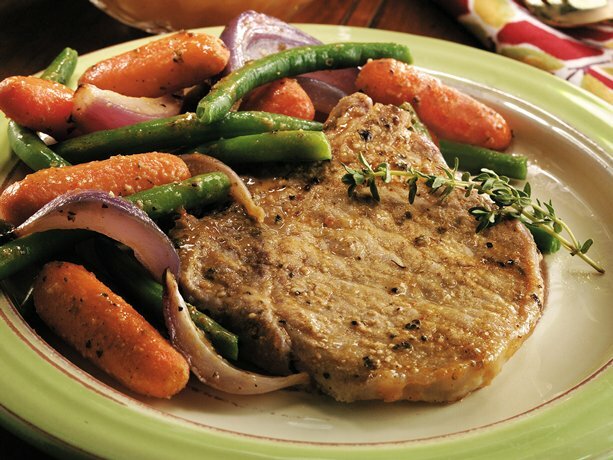 To make in the crock pot pour sauce over pork chops and cook on low for 6-8 hours. 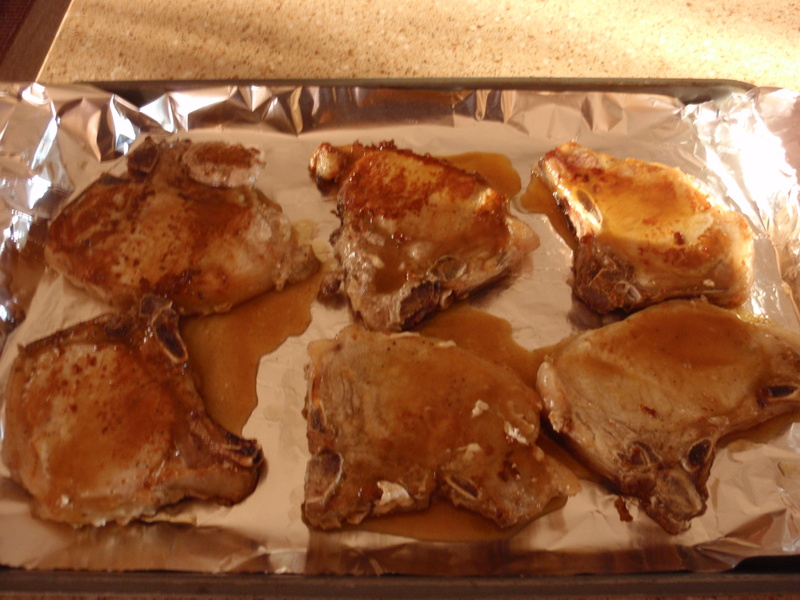 To make in oven: oven to 350, place pork chops in a 11×15 sheet pan , pour sauce over chops and bake for 30-45 minutes. I paired this meal with organic long grain white rice ($.50/serving), organic mixed veggies ($1.88/serving) and of course a glass of Organic Valley milk ($.50/serving). Total cost was: $4.50 per serving. 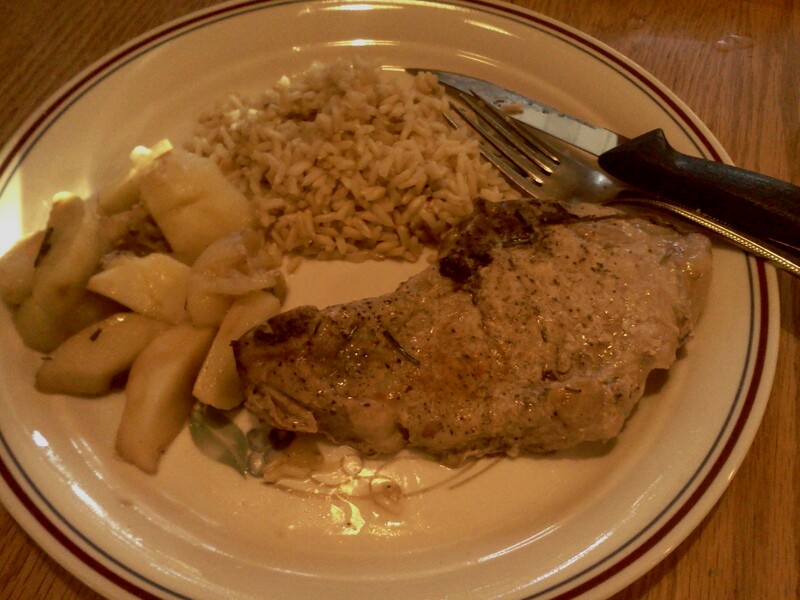 This meal was super simple, super yummy and super inexpensive. Now that is Affordable organics! All of our pork customers have picked up their orders except for a few outliners like Katie at PinkePost and Val at Wag’nTales. 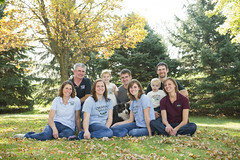 We will not fault them, they do win the prize for the farthest Zweber Farms customers. So we know you have your freezers full of tasty pork chops. If you are new to the Zweber Farms meat, you might be uncertain about cooking chops with the bone in. Here is a great simple recipe I made up today to start you off. 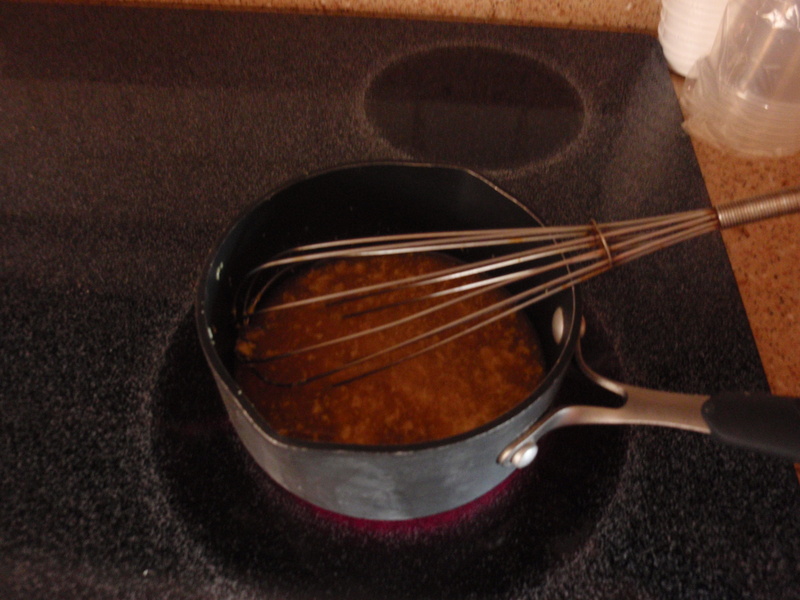 Mix apple cider, brown sugar and mustard into a small sauce pan. Bring to boil and reduce to 1/2 cup. Heat oil in large fry pan. Salt and pepper both sides of chops. Brown chops on both sides. Place chops on baking sheet (okay, I made six chops instead of four). Pour about a tablespoon of glaze over each chop. Save some glaze for finish. Bake for about 8-10 minutes in oven. The pork should be lightly pink inside. 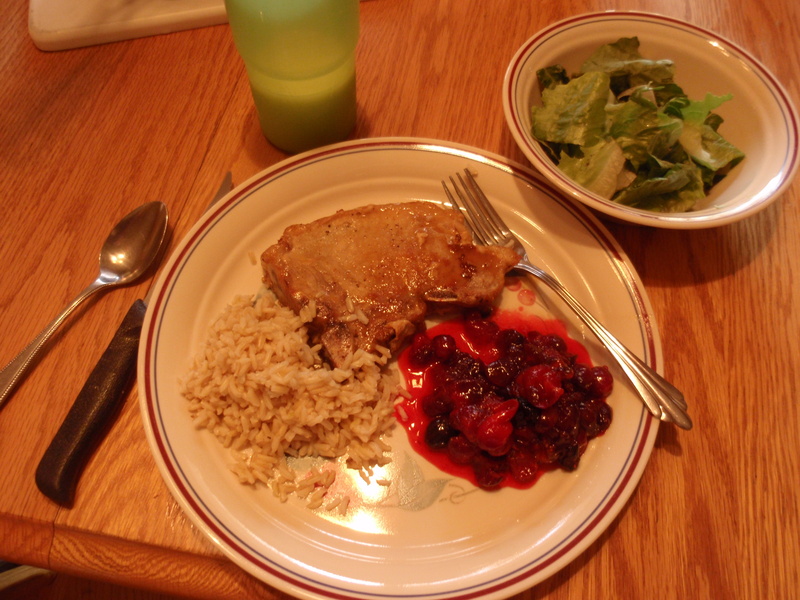 I served the pork chops with cranberries, brown rice, romaine lettuce salad and tall glass of cold Organic Valley milk. 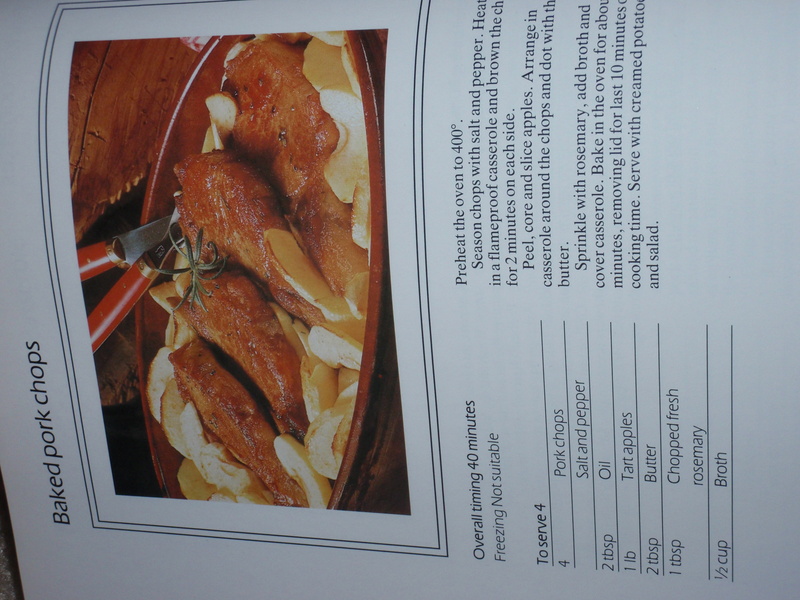 I am a sucker for old cookbooks. To me they are like treasure chests waiting to be opened. My Grandma Baregi, knows I have this love and will pick up cookbooks for me from residents in her senior community. These are the best, because only the best cookbooks stay with you that long (the rest you have re-gifted long ago). This past week I pulled one of these gems off my bookshelf and flipped through the pages for inspiration. I spotted a recipe for baked pork chops that I must share with you. 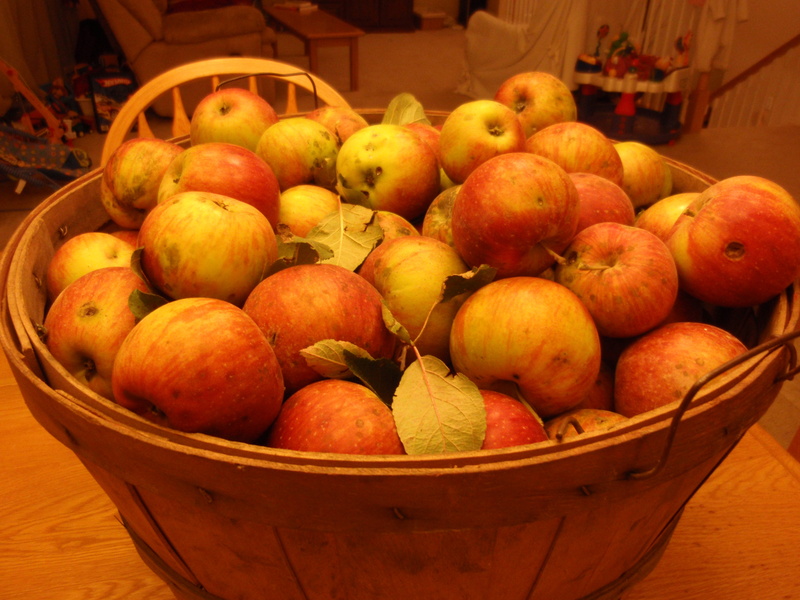 I also had a few leftover apples picked at my parents’ farm. My parents were generous enough to give me a huge bushel basket full. Season chops with salt and pepper. 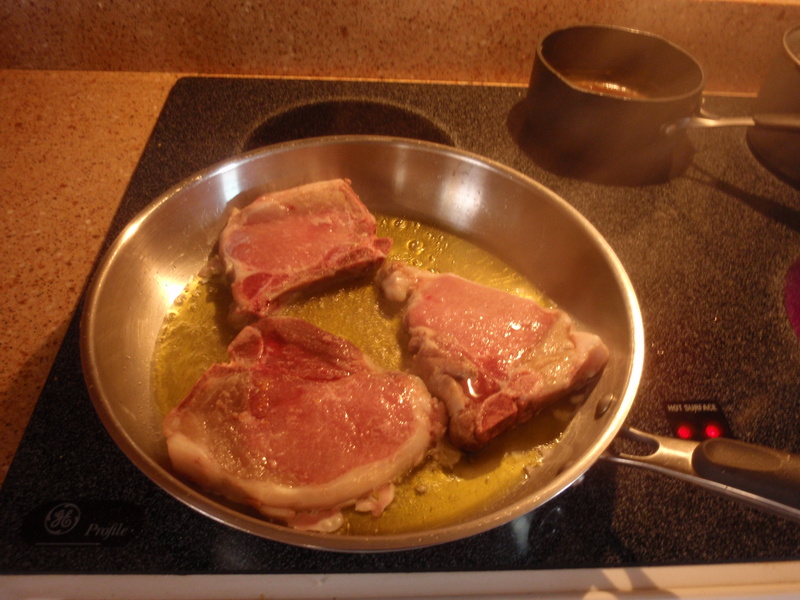 Heat oil in a flameproof casserole and brown the chops for two minutes on each side. Peel, core and slice apples. Arrange in casserole around the chops and dot with the butter. Sprinkle with rosemary, add broth and cover casserole. Bake in the oven for about 30 minutes, removing lid for last 10 minutes of cooking time. This was a great recipe that didn’t take too much thought or pre-planning. I paired with brown rice and a glass of Organic Valley milk. Heat oven to 325 degrees. Sprinkle seasoning on both sides of the chops. Place in baking pan and bake for 30 minutes. Turn the chops once. Make sure the chops reach an internal temp of 155. Let them rest 5 minutes and serve. Of course I forgot to take a picture, maybe next time.